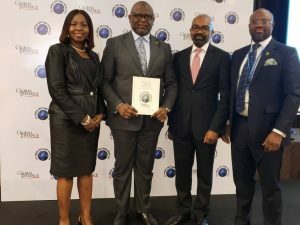 First Bank of Nigeria Limited, the premier Bank in West Africa and the leading banking services solutions provider in Nigeria has been presented with the award of the Best Bank in Nigeria by Global Finance in its World’s Best Banks Award 2018 held on the sidelines of the World Bank/IMF Annual Meetings in Bali, Indonesia. 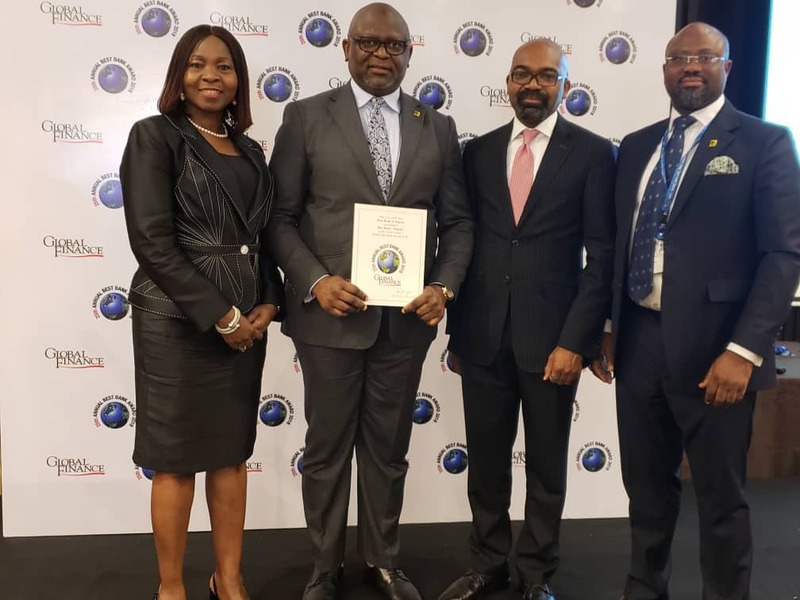 Adesola Adeduntan, MD/CEO, First Bank of Nigeria Limited & Subsidiaries (second left) flanked by FirstBank‘s Bashirat Odunewu, Group Executive, International Banking Group, (left); Ini Ebong, Group Executive, Treasury & Financial Institutions (second right) and Timi George, Group Head, Financial Institutions & Multilaterals (right), during the presentation of Best Bank in Nigeria 2018 award to FirstBank in the Global Finance World Best Bank Awards 2018, held on the sidelines of the World Bank/IMF Annual Meetings in Bali, Indonesia. 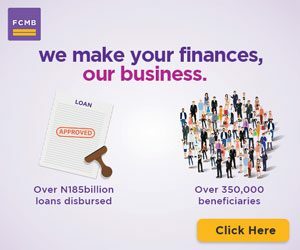 With some 14 million customer accounts, FirstBank provides a comprehensive range of retail and corporate financial services with over 750 business locations. 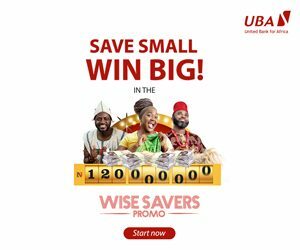 The Bank has international presence through its subsidiaries, FBN Bank (UK) Limited in London and Paris, FBNBank in the Republic of Congo, Ghana, The Gambia, Guinea, Sierra-Leone and Senegal, as well as a Representative Office in Beijing. 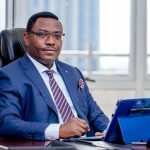 Since its establishment in 1894, FirstBank has consistently built relationships with customers focusing on the fundamentals of good corporate governance, strong liquidity, optimised risk management and leadership. 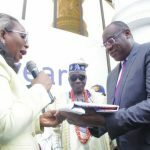 For over 124 years, the Bank has led the financing of private investment in infrastructure development in the Nigerian economy by playing key roles in the Federal Government’s privatisation and commercialisation schemes. 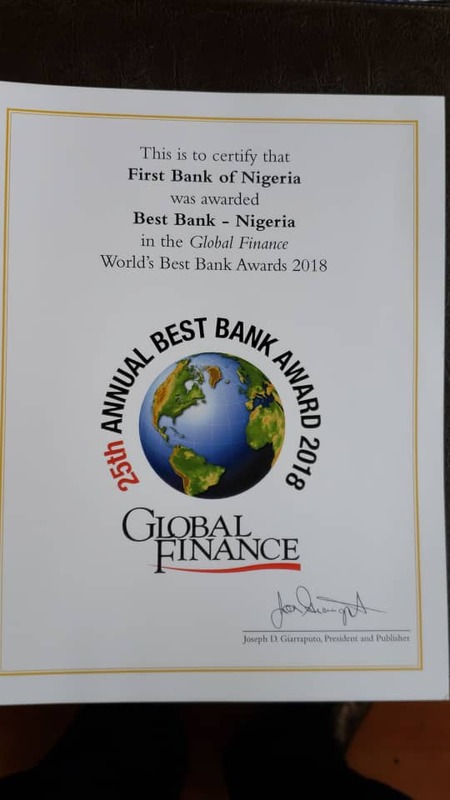 With its global reach, FirstBank provides prospective investors wishing to explore the vast business opportunities that are available in Nigeria, an internationally competitive world-class brand and a credible financial partner.